The new guidance will be made available online and on maternity wards in the UK, and aims to encourage “open conversations” about co-sleeping and the possible risks it carries. Avoiding pillows and duvets, sleeping babies on their backs and keeping other children and pets out of the bed are among the recommendations. The advice for parents and health professionals has been produced by Public Health England (PHE), Durham University researchers, the Lullaby Trust and the Unicef Baby Friendly Initiative. Figures published by the Office for National Statistics (ONS) last year showed a rise in the number of babies dying from unexplained causes. There were 219 deaths caused by sudden infant death syndrome (SIDS), or without a known cause, in England and Wales in 2016, up from 195 the previous year. However, the number of SIDS deaths has declined over the past 25 years. Wendy Nicholson, national lead nurse for children, young people and families at PHE, said: “We know that it may be difficult to have open conversations about the risks of bed sharing when talking to parents about safe sleeping. “These important new resources will support health professionals’ conversations with parents who might share a bed with their baby, to help more families get the right advice on how to keep their baby safe. Information on safe sleeping will be distributed in maternity units through the Unicef Baby Friendly Initiative, which is working with hospitals across the UK to improve standards of care. 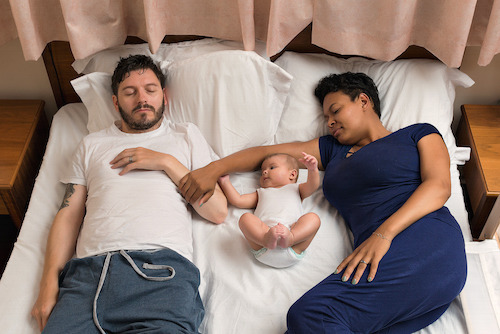 The guide, based on existing research, recognises that many parents choose to sleep next to their baby, or may unintentionally end up doing so. It recommends ensuring babies cannot fall out of their bed or become trapped between the mattress and wall, and never leaving them alone. The advice warns against sleeping with a baby on a sofa or armchair, which increases the risk of SIDS by 50 times. It also tells parents they should not share the bed if they smoke, have recently drunk alcohol, or if their baby was born prematurely or was under 2.5kg at birth. Jenny Ward, acting chief executive of the Lullaby Trust, said: “It is a reality that even if parents do not plan to co-sleep, many still fall asleep with their babies unintentionally. “Babies can and do die in high risk co-sleeping situations.